Perhaps the most inspiring initiatives for a culture of peace in recent years has been the peace process in Colombia. Here are the CPNN articles that have followed this process since the beginning of 2015 – with the English versions on the left and the Spanish versions (when available) on the right. For a list of articles prior to 2015, click here. Antioquia, Colombia: ¡Jóvenes unidos por una Paz Territorial! 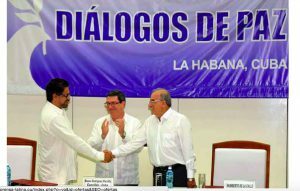 Colombia: “El proceso de Paz es de todos”.